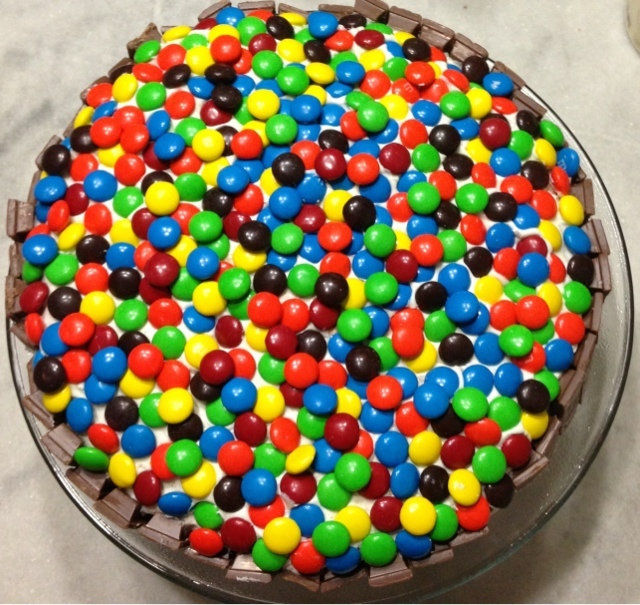 A few days before Ayaz’s birthday, I came across an image of a cake that was decorated with smarties [the English version of M&Ms?] and chocolate covered biscuits. It immediately made me think of replicating the idea using M&Ms and kit-kats! With Ayaz’s birthday around the corner, I had a perfect excuse to try it out with my twist to it. 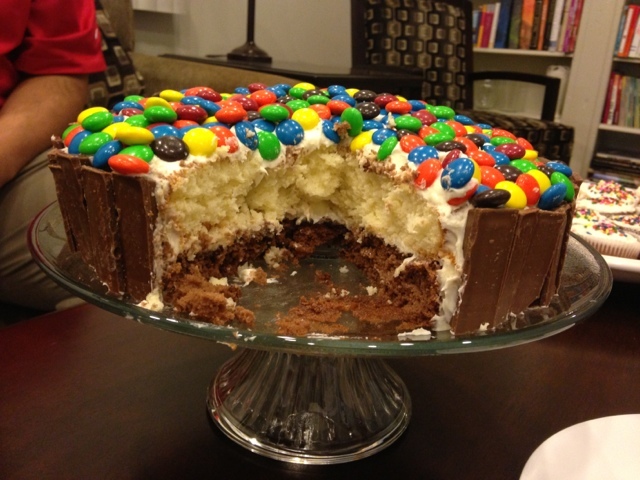 After frosting the cake, and adding kit-kats all around the sides of the cake, I started adding the M&Ms. This is when my dad suggested I spell my brother’s name out on it. But, it would have worked better, I suppose, if I was working with only two colors of M&Ms. Very quickly, it was apparent that it wasn’t going to work out too well in the end. Oh well, it’s the thought that counts (and the above photo). On the inside: layers of milk chocolate cake and french vanilla cake (separated by vanilla frosting which is making the white part of the cake look thicker). I took help from the grocery store for the cake, and used cake mixes, since the process in itself to put the cake together was going to take several hours… and I had to wait until Ayaz left for work to start. 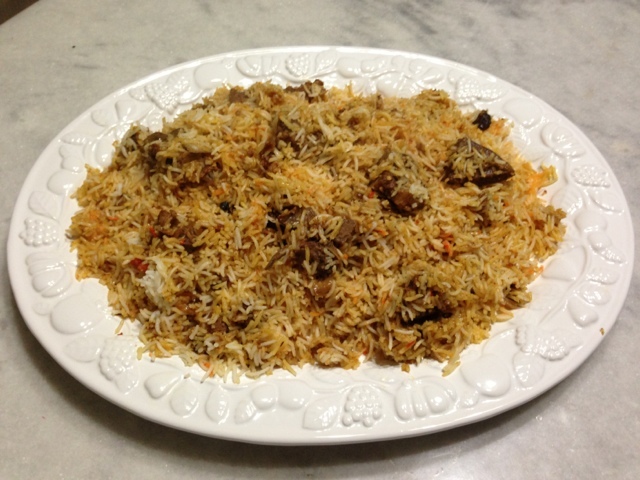 It turned out to be a good thing I decided to do that, because I wasn’t planning on making Biryani that day either. That took quite some time in itself. Next time, however, I’d probably use my own cake recipe. 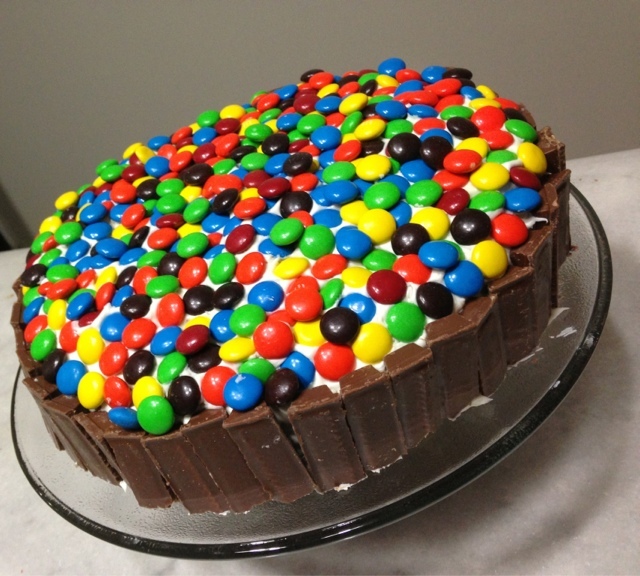 Anyhow, I contemplated having an ice-cream layer to the cake, but decided against it because of the messiness factor and wasn’t sure how well it would work with the M&Ms and kit-kats. I wanted to include both chocolate and vanilla cake portions in it, so I used Milk Chocolate and French Vanilla [he got both vanilla and chocolate out of it… and I got my favorite of the each]. From each box mix, I used half of the cake batter to bake off a round 9-inch pan worth of a cake. For the other half of the batter that was left over, I just used it up to make 12 cupcakes. So in the end, I had two 9-inch cakes and 24 cupcakes: half being french vanilla and half milk chocolate. The vanilla and chocolate each have their own baking time. I wasn’t counting on that and was hoping to bake both of the cakes together to quicken the cooling time. Instead, I baked the milk chocolate cake and the milk chocolate cupcakes in the first round, followed by the french vanilla version. After they were done cooling completely, I took my cake dome out (only used the bottom plate part). I lined the edges of it with four small parchment paper pieces and flipped out my milk chocolate cake onto it. Side note: I lined the plate with the parchment paper so that when I frosted the cake, the mess would be on the parchment paper, not the edges of my platter. 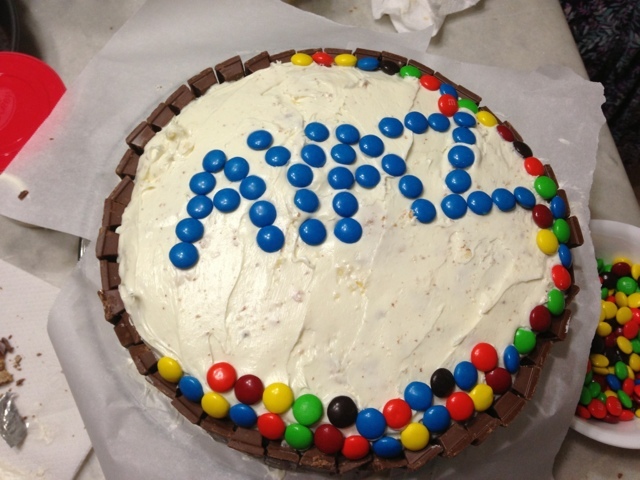 You can see the parchment paper in one of the pictures above (where the M&Ms spell out Ayaz’s name). When I was completely done with the cake, I just slid the pieces of parchment paper out from each end. Note that it is much easier to have smaller pieces of parchment paper, instead of one large one, when you are ready to remove the parchment paper at the end. With my first layer of cake on the platter [the milk chocolate one in my case], I frosted the top portion of the milk chocolate cake as an adhesive [and creamy center] before adding the second layer of cake [the french vanilla] on top. Then, simply frost the top and sides of the cake, covering every visible part of the cake with frosting. I used vanilla frosting throughout the cake because I thought it would be a nice balance and offset the chocolate in the rest of the cake [the chocolate cake, chocolate M&Ms and, of course, the kit-kat bars). While it was the perfect balance, and I don’t think I’d change that, if you look at the picture that shows the inside of the cake: it seems as if the vanilla portion of the cake is twice the size of the chocolate cake; you can’t really tell that the middle of it is actually frosting. Oh well. Once you have completely frosted the cake, add the kit-kats all around the cake. Keep them as close as you can, leaving no space in between them. The frosting on the cake makes the kit-kats adhere without any problems. I used 2 packs of the 4.5 ounce package of kit-kats [it has 3 regular sized 4-piece bars], which equaled 24 individual kit-kat pieces… and it was the perfect amount to go around my frosted 9-inch cake. Tip for you: the fun-size kit-kats would work perfectly for a two-layered cake. I had originally bought them, and was convinced that they would be too short, height wise, for the size of my cake once I had layered the cakes. I returned the fun-sized kit-kats and, instead, bought the regular sized kit-kats. Guess who had to cut all the kit-kats in half? Once the kit-kats were added on, I added M&Ms on top. One 12.60 ounce bag of M&Ms was perfect. Now, any ideas for how I beat this for when Faraz’s birthday rolls around? Mangoes are one of my favorite fruits, alongside guavas. Strawberries and watermelon come a close second. Usually when I have mangoes on hand, I want to just eat it as in. It never lasts long enough for me to use it as a part of a meal. With raw mangoes in hand, I decided to make a salsa. I wanted to contrast it with strawberries, but I didn’t have any on the particular day I first made this. 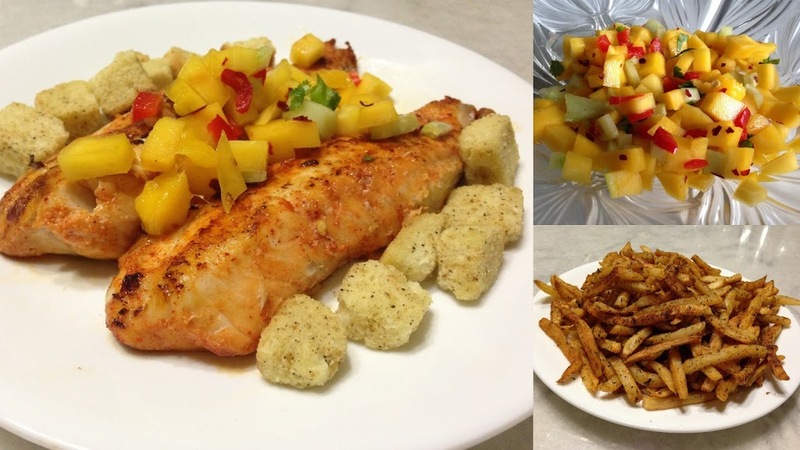 I served it on top of my baked Tilapia fillets and alongside my Seasoned French Fries (that are baked), so this day’s meal turned out to be a healthier version (or my version) of “Fish and chips”! I served it alongside Tilapia fillets, but I think the salsa would go great with [grilled] chicken as well! For the Tilapia, I used pretty much the same [basic] recipe as the one from this link, but just added red pepper flakes to it also. I baked it in a pre-heated 350 degree oven for about 20 minutes, flipping them over once in between. All fair questions indeed. And ones to ponder. For many, hard times bring them closer to their faith (and therefore, the Creator). For others, if even for a moment, it makes them question and doubt. Note: I started this post in the aftermath of Newtown… but lack of time got the better of me. I still think it applies, nonetheless, in general to many situations… regardless of what scale it is at. A friend who I’ve know for many years, an atheist, in several different situations has brought up these questions directly to me. In the immediate aftermath of the Newtown tragedy, it was, of course, brought up again. To begin, I would like to point out that I don’t like labeling this person as an atheist in the post. We don’t go around labeling people as “believers” or more specifically as a “Christian”, “Muslim”, “Jew”, etc. and I don’t think it is appropriate to do so in terms of atheists either. I also don’t think that anyone, of any belief, can honestly say that at one point or another they didn’t question Him. If they did, they aren’t being honest. While I firmly believe in (and always have) fate, and the fact that everything happens for a reason and that He knows and plans all, I can also understand why it’s hard for someone to not only question why, if there is indeed a God, would He let disastrous events occur BUT more importantly why it was destined to happen. I get that. I just think there’s a bigger picture that is being missed. That, [verily] with every hardship, comes ease. This world is, indeed, about tests, trials, and tribulations. And why do we immediately blame God in the midst of tragedies, when we don’t autonomously turn to him in good times as well? It’s so easy to say “why me? !” in bad times, but how many of us say that in good times? What do you say to someone with this argument? I’m not trying to win an argument, or to say I’m right and you are wrong… or anything of that nature. I value their opinion and point of view. I just want something substantive that highlights my point of view all at once. Tonight, we had an early birthday celebration for my brother Ayaz. 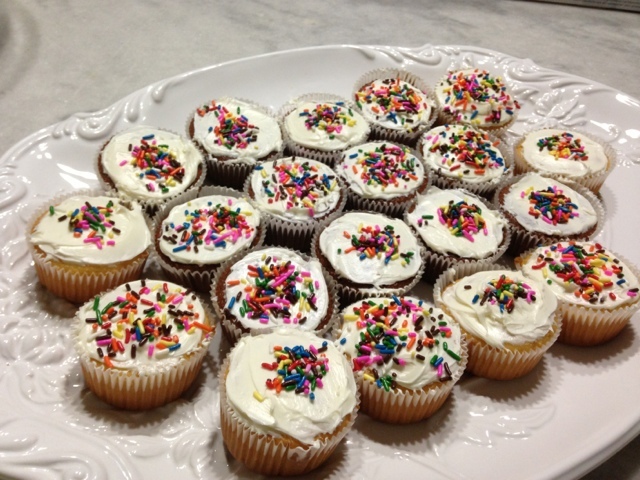 French Vanilla and Milk Chocolate cupcakes, with vanilla frosting and sprinkles. I took boneless chicken breasts and cut them into thin strips. All of the above, quantity wise, were to taste. Turn the broiler in your oven on to high. I then skewered the chicken. I used metal skewers today, but wooden ones that are easily found in the baking aisle at your local grocery store work as well. 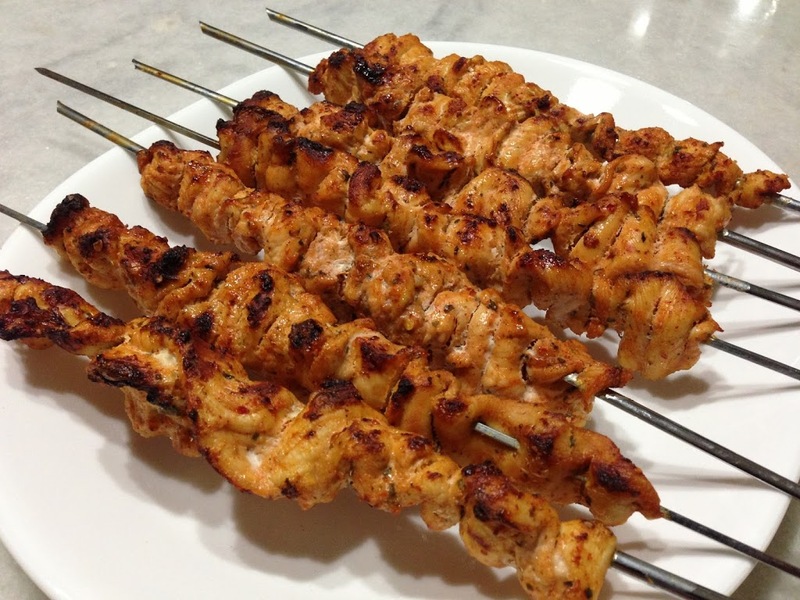 Just leave the wooden skewers in water for a while [at least half an hour] before using them, so they don’t turn completely black while in the oven. 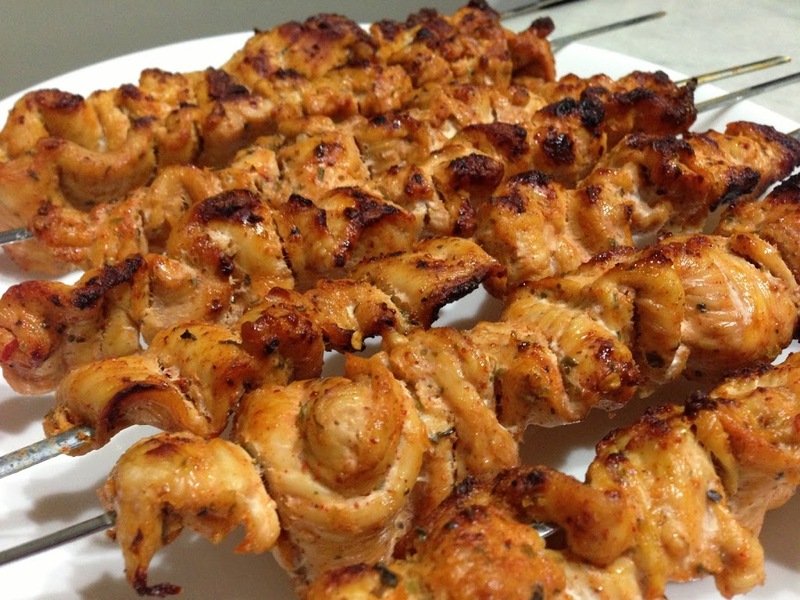 Once all of your chicken is skewered, put it in the oven under the broiler [on high] for 15 minutes. Then take them out, flip all of the skewers upside down (not easy to do sometimes)… and put it back in the oven for another 10 or so minutes. Just keep an eye on it. Serve it warm. With raita, or some quick and easy sauce, would be great. This particular day, I served it with fries and I made the homemade Cheddar Bay Biscuits from scratch again. Tip for you: Make sure that when you have the broiler on, you leave the oven door open a little bit. Most ovens, I believe, can remain a little bit open on their own. Not exactly sure why you are supposed to do this, but you are. I’m guessing to let the smoke escape, perhaps? If for no other reason, than this: I’ve always found that the food in question remains more moist when I leave the door open. A few times, I’ve forgotten to leave the oven door ajar and with the heat so high, the food had become tougher. Looking for a fries recipe? Click here and try this one that I make. Updated Note 3/19: Now that I think about it, I guess I should have explained the raw papaya a little more… I’m sure it’s not too common. It’s something I saw my mom using as a tenderizer growing up, and I’ve been using it myself as well, so it’s just second nature to me. It doesn’t add any taste, just helps tenderize the meat/chicken [you can’t even tell it’s in the marinade once it’s all mixed up!]. I guess a meat tenderizer would do the same thing, but I don’t remember ever using it! Why not use a vegetable if you can, right? Trust me, it doesn’t add a funky taste or anything… you can’t even tell it’s in there — but it makes a huge difference in the moistness and tenderness! What I do is: I take raw green papaya (not the orange/yellow one… makes a difference), and cut it into manageable pieces… and throw it into my food processor to do all the work. You want it minced into a pasta-like consistency… very thin! I use how much I need at the moment, and put the rest in a large zip-loc [and into my freezer], so it’s ready for me when I need it next time. For about 2-3 pounds of chicken, I’d say I use about 2-3 heaping tablespoons worth of my raw papaya concoction. Another tip: once the remainder of the papaya is frozen, break them into single-use sizes so you can just pull them out individually instead of waiting for the huge piece to defrost (this is something my mom does… I never remember until I actually need to use it). I should also mention that I don’t use papaya every time: usually only when baking, broiling or grilling that would perhaps make the chicken/meat tough in the process. This picture, above, is before I cut them up into bars. My goodness are these bars delicious! Easy to make, soft and gooey, and very tasty! 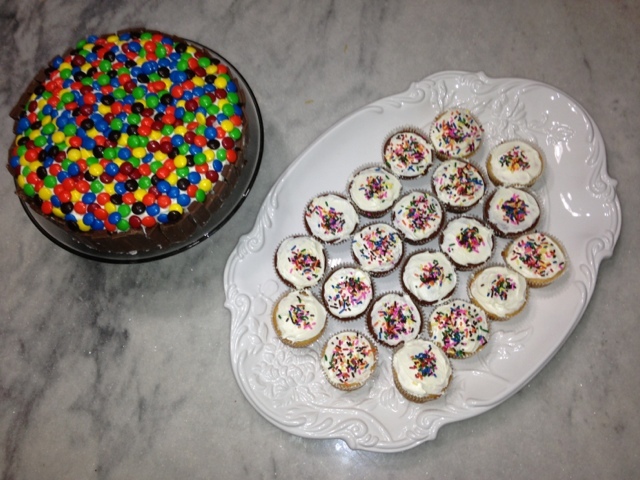 From start to finish, it probably took me 30-35 minutes to make these, including the baking time! Preheat your oven to 350 degrees. Spray your square/rectangular dish with non-stick cooking spray (or you can also line your dish with wax/parchment paper that is long enough that it will come up across opposite sides and let you lift it out of the pan later). 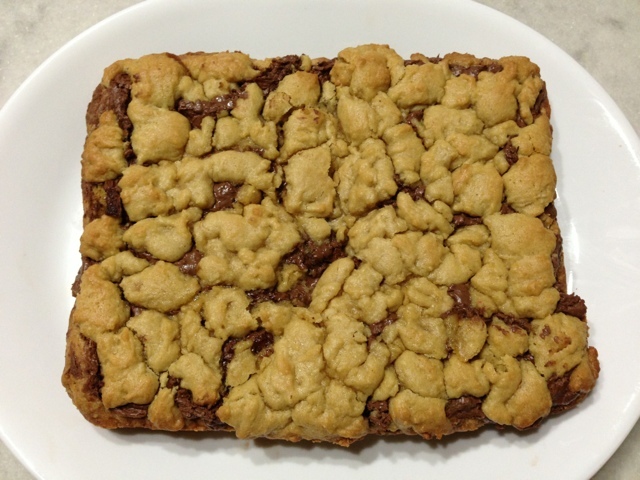 In a double boiler, melt 1/2 cup of nutella and 3/4 cup of milk chocolate chips. Set it aside to cool. In a mixing bowl, beat your softened stick of butter with an electric mixer until it is nice and creamy. Add in the 3/4 cup of light brown sugar, and mix well until the mixture is smooth. Add in your two eggs and the 1 teaspoon of vanilla extract. Combine your 2 cups of flour, 1/2 teaspoon of baking soda and 1/4 teaspoon of salt in a small bowl. Gradually add your dry ingredients into the wet mixture until it is well incorporated. Take about 2/3 of the dough and press into the bottom of your dish. Pour in your chocolate-hazelnut mixture on top and spread evenly. Take the remainder of your dough that you set aside, crumble it and then sprinkle it on top of the chocolate/nuts. If the dough seems too wet, add a little more flour to it. Bake it in oven for 20 minutes, or until it is golden brown on top. Once it is out of the oven, let it cool for 10 minutes before cutting them into bars. I was able to flip it out of my glass baking dish that I used and then put it in a serving dish quite easily before cutting them. You could, of course, just cut them into squares in your baking dish. They are decadent, and I made 35 small bars out of them (7 by 5’s). A small piece goes a long way, even though they are very addicting! Next time, I’d probably add in about 1/2 cup to 3/4 cup of hazel(nuts) too in the portion of the chocolate mixture and see how that turns out. 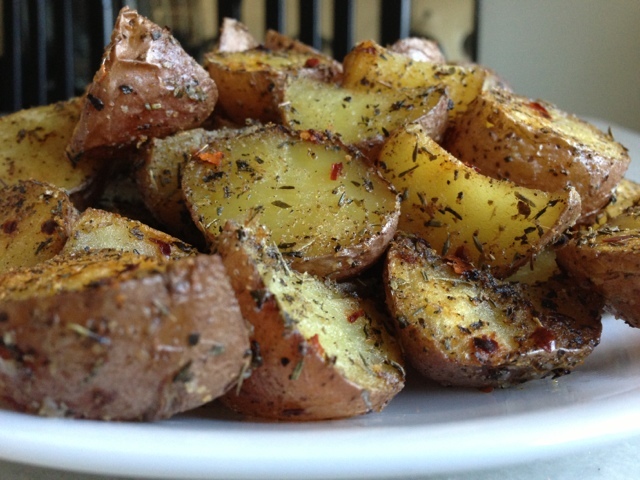 Today, to serve alongside with another variation on my oven-fried chicken [this time I also used thyme alongside the rosemary and basil] for dinner, I roasted small red potatoes, mixing a combination of herbs and spices that made them wonderful. The aroma as they were in the oven was amazing, and so was the aftermath. Preheat your oven to 350 degrees. Line your baking sheet with foil [for easy cleanup]. I used about 15-20 small red potatoes and halved them. Then, spray your halved small red potatoes (or whatever type of potatoes you are using; just make sure they are all cut to the same size for even cooking time) with non-stick cooking spray [or use oil if you want and prefer that]. The herb and spice mixture that you just mixed together? Sprinkle that over your potatoes. 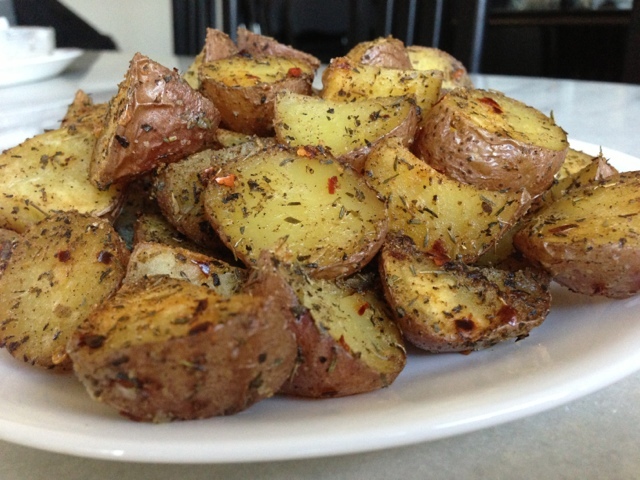 Mix well with your hands, making sure all the potatoes are coated nice and evenly. Face all potatoes skin side up. Bake in the oven, initially, for 25 minutes. After the first 25 minutes, take them out, and turn all the potatoes over (facing skin side down now). Bake for another 20-25 minutes. Total cooking time: will be around 50 minutes.